Bell & Gossett packing for model SA-3/4 , SA-1, SA-1-1/4, SA-1-1/2, SB-3/4, SA-2, A-2-1/2, S-2-1/2, A-3, and S-3 Flo-Control valves, as well as, model TB-3/4, TB-1, 3DX-1, 3DX-1-1/4, and 3DX-1-1/2 triple duty valves. This packing can also be used on obsolete model SA-3/4 and SB-3/4 Flo-Control valves. 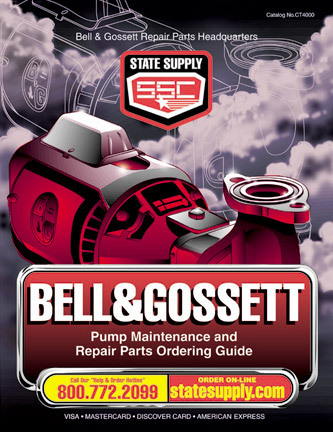 Bell & Gossett packing for model S-4 Flo-Control valves, as well as, model 3D-2S, 3DS-2G, 3DS-2S, 3D-2-1/2S, 3DS-2-1/2G, 3DS-2-1/2S, 3D-3S, 3DS-3G, 3DS-3S, 3DS-3B, and 3DS-4B triple duty valves. Bell & Gossett packing for model 3D-4S, 3DS-4G, 3DS-4S, 3D-5S, 3DS-5G, 3DS-5S, 3D-6S, 3DS-6G, 3DS-6S, 3D-8S, 3DS-8G, 3DS-8S, 3D-10S, 3DS-10G, 3DS-10S, 3DS-5B, 3DS-6B, 3DS-8B, 3DS-10B, and 3DS-12B triple duty valves. Order three to make a complete set. B&G part number G10033 is a valve packing only for models CB-4,5,6F & CB-4,5,6G globe style circuit setter balancing valves. The packing is under the packing nut onto the bonnet to seal the valve stem. B&G part number G10041 is a valve packing only for models CB-8,10F & CB-8,10G globe style circuit setter balancing valves. The packing is under the packing nut onto the bonnet to seal the valve stem.